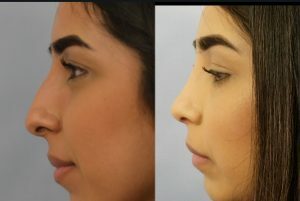 Correction of a deviated (crooked) nose and septum one of most components in rhinoplasty. 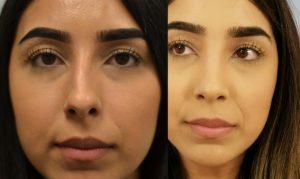 Straightening a deviated nose involved straightening the nasal bones, septal weakening by scorring to allow it to straighten, and keeping the septum straight by adding cartilage grafts of one or both sides of the septum. This patient had nasal and septal deviation before surgery. She underwent closed rhinoplasty. Her septal cartilage was scorred and cartilage grafts (from her own septum) were used to keep the septum in a straight position. In addition, her dorsal hump was removed and the tip narrowed.